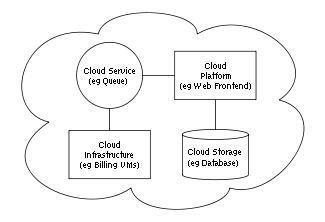 Cloud computing refers to the storing and accessing data and programs over the internet rather than on the computer’s hard drive (Badger, Grance, Patt-Corner & Voas, 2012). It is the delivery of computing services over the internet and allowing network access to computing resources, webmail, social networking sites, online file storage and online businesses, shared by a group of people. Cloud computing provides a common and shared pool of resources such as corporate and user applications, networks, and storage space. Many organizations are adopting the computing technology as a way of providing network-computing resources to their customers over a network. Through cloud computing, an organization can get access to on-demand self-service computing capabilities like network storage and server time whenever they need. There is also access to resources based on different platforms such as personal digital assistants (PDAs), on their laptops or mobile phones through broad network access. The computing resources from the provider are pooled to be able to serve various consumers through a multi-tenant model. In this approach, consumers are assigned and reassigned different virtual and physical resources. The allocation of resources is according to their demand where they are advised to specify the institution or data center from which they request resources since they are not in control of the virtual machines providing the resources. The consumer can also access cloud capabilities instantly and elastically therefore allowing them to control the services. Cloud systems are capable of optimizing and controlling resources by measured service capacity and thus ideal for controlling and monitoring usage of resources hence assuring transparency for both the subscriber and provider (Badger, Grance, Patt-Corner & Voas, 2012). By pooling the computing resources, a public deployment model is, therefore, applicable where the cloud computing infrastructure is available to a large number of consumers as well as the large organizations. The consumer and the provider have a legally binding agreement that defines terms of service for a cloud infrastructure categorized into two parts. First is the service agreement that is a document that establishes the rules and regulations of the contract between the subscriber and the cloud service provider. Secondly, the agreement also involves a paper outlining the promises to the consumer regarding technical performance as well as how to solve possible performance failures (Badger, Grance, Patt-Corner & Voas, 2012). This agreement is, therefore, advantageous to a public cloud deployment model as it assures the customer of the privacy and security of information from the provider. An organization can use service agreements among its units to align the services provided by an organization with its goals and objectives. Although, small scale users or individuals are forced to accept the terms as given by the provider, large-scale consumers with the heavy use of cloud resources can negotiate for favorable terms. The users in a public cloud scenario have an advantage of enjoying efficient services at affordable prices. The service agreements can terminate on different occasions. Failure to pay on time by the subscriber, violation of cloud policies or for no reason. Therefore, it is important for consumers in a public cloud to understand the data retention and termination policies as defined by the provider. It is necessary for subscribers of Public cloud to analyze and understand how providers calculate the uptime percentages when advertising the availability of their cloud resources. On failure to fulfill the promised availability, providers should offer compensation in terms of service credit that are determined by the time the service was not available during a billing period. Consumers of public cloud model should also understand the legal care of their personal information and data preservation policies as defined by the provider (Badger, Grance, Patt-Corner & Voas, 2012). Providers may not be accountable for failures resulting from natural occurrences of an even scheduled service outage. Providers may also change the terms of service agreement such as pricing after notifying the consumer. Web-based applications on cloud computing have become a buzz word in the technological sector. As such, it poses an interesting area of research and discussion. Mobile phones have proliferated the modern society, and they are potential benefits for addressing the digital divide (Analysis of Smartphone Security Problem - Android and iPhone, 2013). Digital divide is evident in marginalized and rural areas. Today’s mobile phones have evolved from simply being devices of sending mere texts and making calls to more sophisticated, computerized smartphones. However, despite this multi-purpose capability, mobile phones are still faced with various challenges of space, battery life and computational capabilities. Cloud computing has the potential of transforming the whole IT industry. The dedication of this research aims at exploring whether it is possible to increase the computational power and speed of mobile phones through offloading heavy application functions.